The house shows off its views of the water from every side. Glass doors, metal roof, stucco, and stone make it beautiful as well as low maintenance. This waterfront home in Hudson on the Willow River lies low on the land. 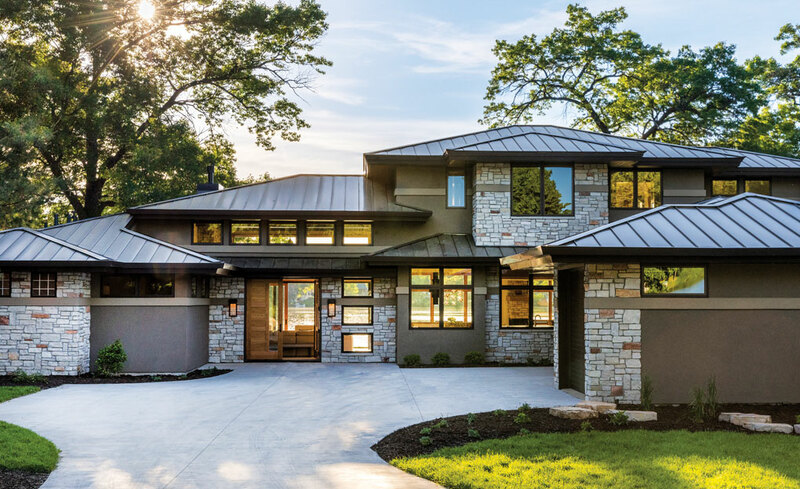 The modern Prairie-style design, echoing Frank Lloyd Wright’s organic architecture, harmonizes easily with its setting. In fact, surrounded by water on its peninsula site, it feels as much like a luxury yacht as a house. 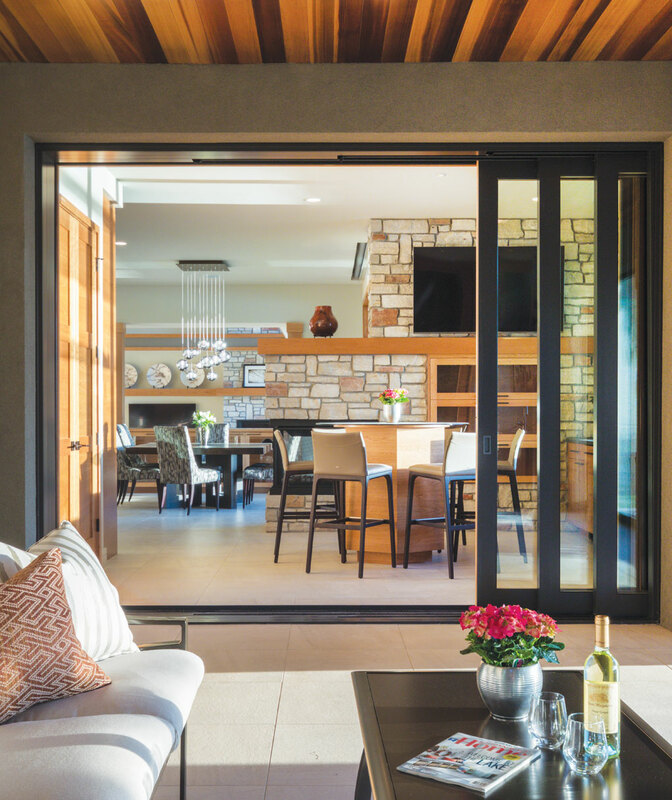 A three-sided Chilton stone fireplace divides the bar and dining area, while pocket doors disappear into the wall between house and screen porch. 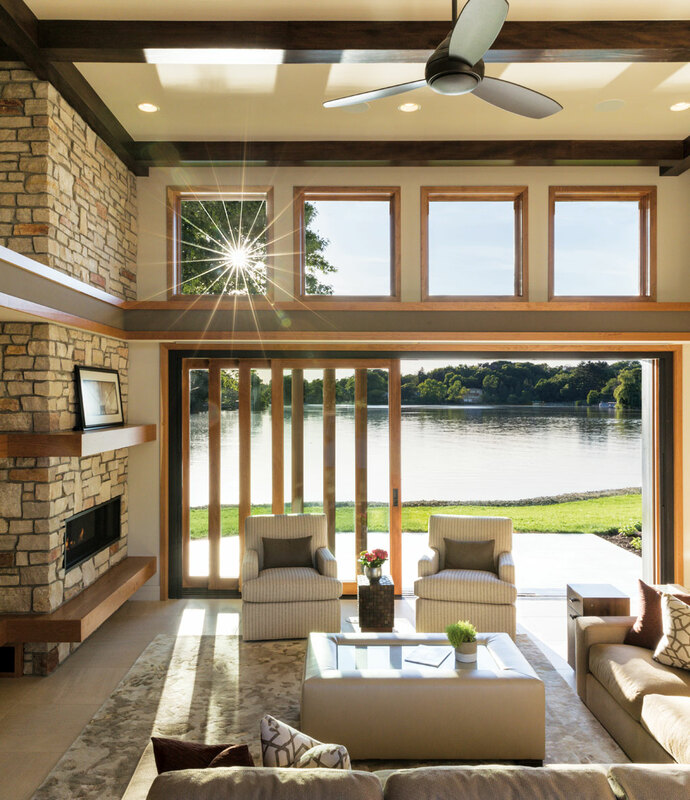 Bruce Lenzen Design/Build brought the home to fruition working primarily long distance with Gloria and Ken Derks, its Texas-based owners. The couple, longtime residents of Hastings, purchased the site in 2015 and knew Lenzen’s work from previous tours. “We always had the pleasure of meeting him and liked his design aesthetic,” she says. 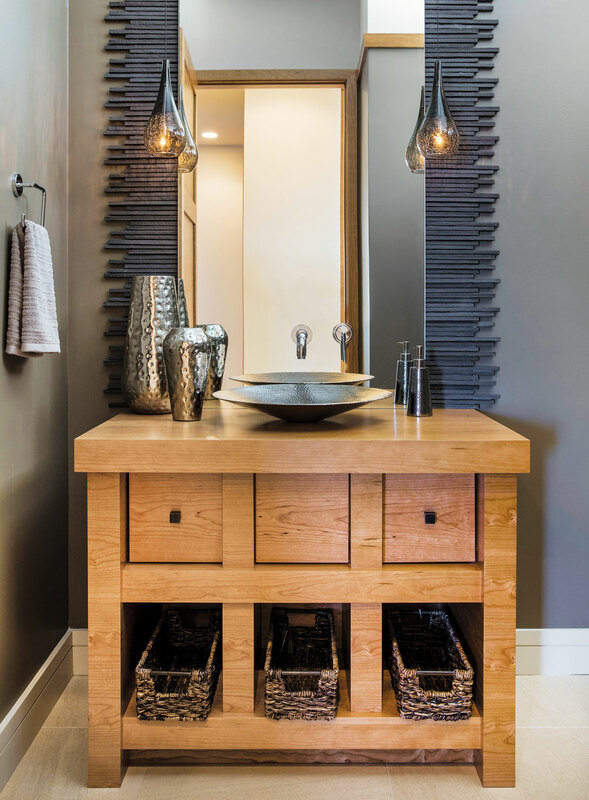 The powder room, one of the spaces without a water view, continues the low-key décor. The Derks knew they wanted an open floor plan, with lots of windows, clean lines, and several built-ins. Lenzen delivered all that and more. 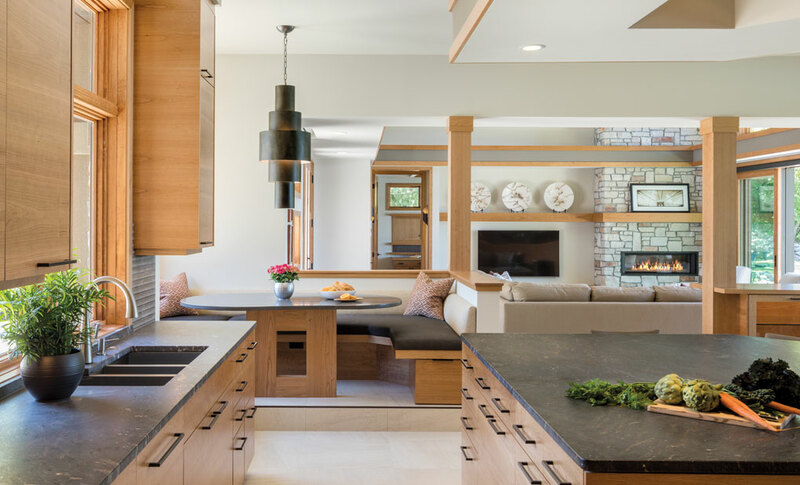 The rift-cut and horizontal-matched cherry cabinetry is on display in the open kitchen. The perfect setting for open-air parties (a screen door bars unwanted pests), the bar area features a built-in table (the top will be hammered copper) and cabinetry along two sides. Disappearing pocket doors between the house and screen porch further enhance the flow. The tranquil open spaces also benefit from the understated color palette of the Italian porcelain tile floor that extends from inside to out, the Chilton stone of the fireplaces, the natural cherry millwork, and the matched cherry (rift-cut and horizontal grain) cabinetry and built-ins throughout the house. The breakfast nook includes a built-in table and banquette. Built-in furniture abounds here: the buffet between the great room and dining area, the banquette and table in the breakfast nook, the copper-topped table in the bar area (the glass is temporary), the bed and side tables in the main-level master bedroom and guest suite upstairs, and the desk in the second-floor office. All contribute to the spacious feel of the 3,600-square-foot house (4,233 with the screen porch). 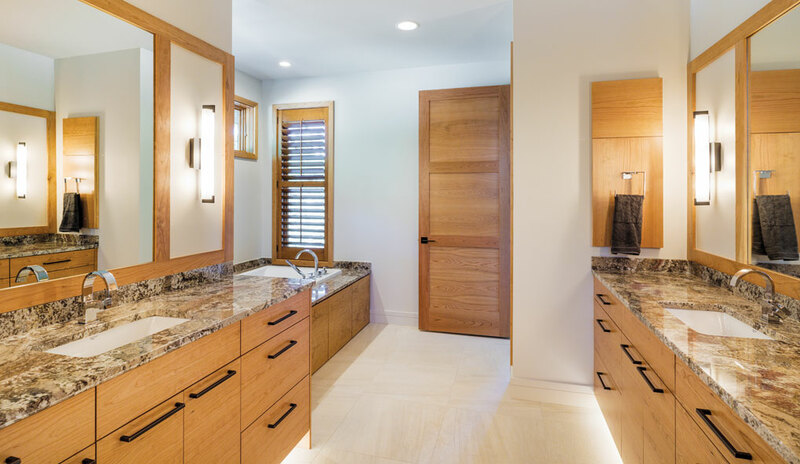 The main-level master suite features a built-in bed and night tables, as well as an art piece of the same rift-sawn cherry. The Derks wanted a home conducive to entertaining—thus the open spaces that make everyone, including the cook, part of the action. Gloria also specified a square dining table—the better for general conversations at dinner parties. The custom black oak table, designed by Lenzen and built by cabinetmaker Tom Carlsgaard, seats eight without the leaves or 12–14 with them. Interior designer Ann Ludwig added distinction with the sparkling orbs of the chandelier pendants overhead. The Kadur pendants above the custom dining table add sparkle to the view of the river. 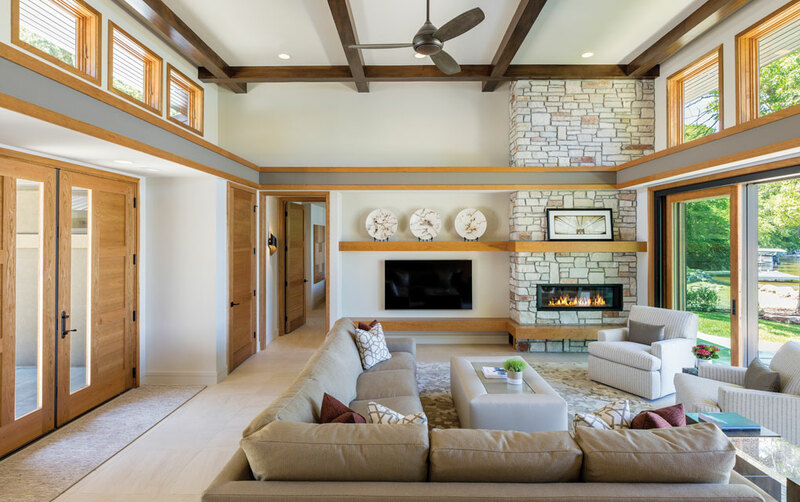 The couple says building their new summer home was a pleasure, especially working with Lenzen as he designed unique solutions for them. “We have this spectacular view, so we didn’t want window treatments,” says Gloria. Lenzen came up with the solution: All the windows and doors on the main level have hidden blinds that are tucked away in the soffits. “With the press of a button they disappear,” she adds. 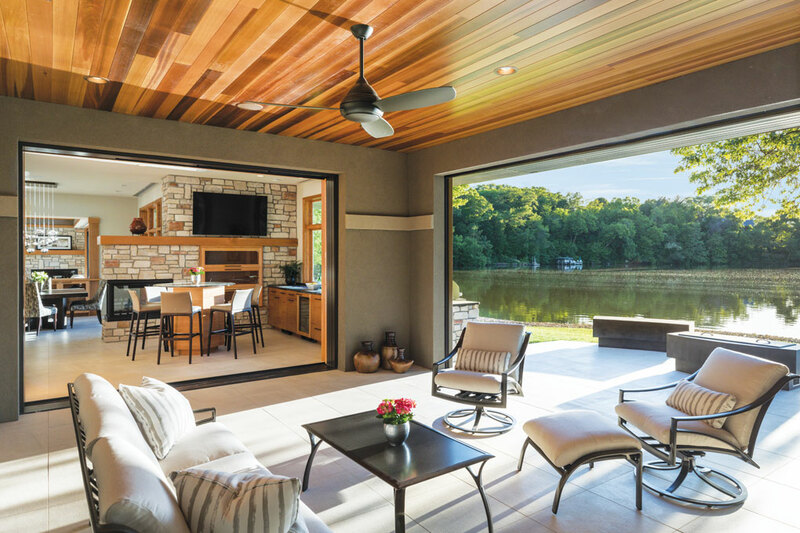 In lieu of window treatments that would block the view, blinds above the doors and windows on the main level are hidden in soffits until needed.